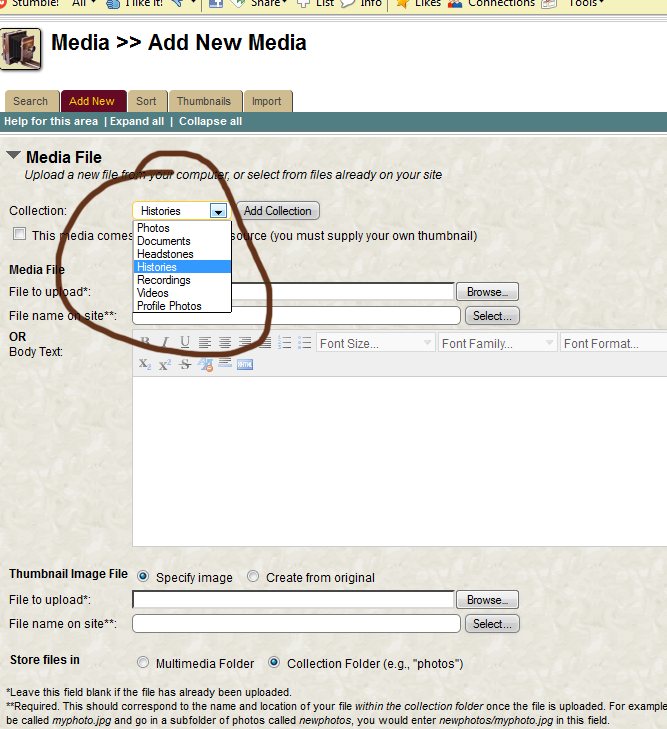 When you are logged on to TNG, and in edit mode, either editing a family or editing a person, you can add media. 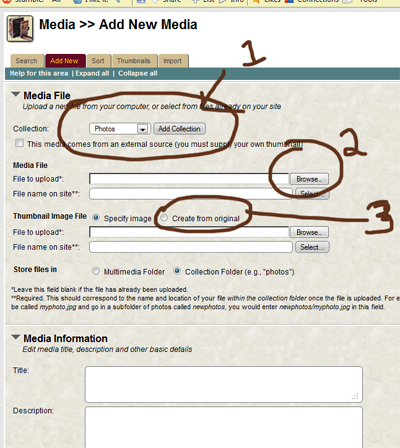 For example, if you have a photo of a person that you would like to have as a default on the person page, a family photo you would like to have showing as default on the family page, or a document such as a birth certificate, pension record, etc, you can upload it. There is a size limit on documents and if, when uploading you get a message that the photo or document already exists, please stop and rename your file to something distinctive, such as appending your kit # on it, or the date. For example, if your kit number is 12345, then name the file 12345. jpg (or whatever the file type is). If there is more than one, you can name it 12345a, 12345b, etc. 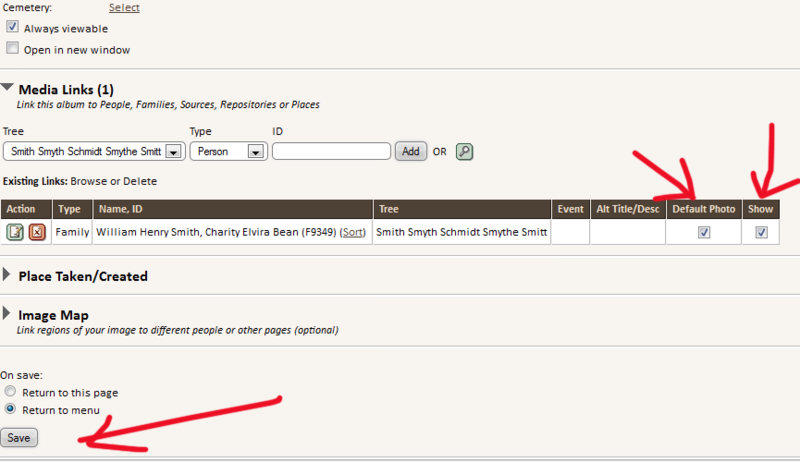 This type of naming also helps us identify who sent the file. The reason is that there are a huge number of John Smiths, for example, or John Smiths from NC, etc, so each file needs to be of a reasonable size and distinctly named. If you need help sizing down the file, we’re happy to help. PLEASE KEEP YOUR FILE SIZE TO MAXIMUM 2 mg. 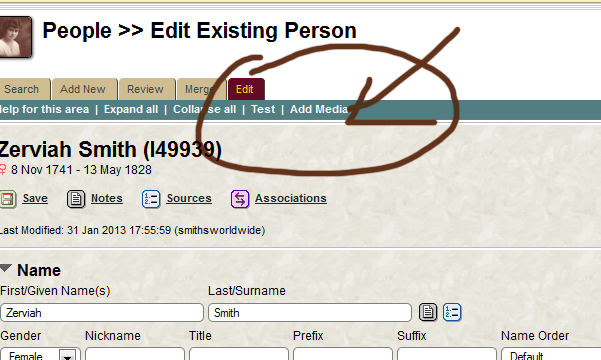 In edit mode, look on the menu strip above the person or family name for ADD MEDIA. If you do not see this, you are not logged on. Next you will be specifying which type of file you’re wanting to upload. Is it a photo, a document, a history (such as a Goodspeed history) or a headstone photo. If you are going to link to a URL be sure and check the box that says that the media comes from an external source, otherwise, browse to find the file on your computer. A history type allows you to type in text (or paste it in) in lieu of uploading a file. For a photo or a headstone photo, be sure and choose to create a thumbnail photo. This will make a fast loading smaller version of your photo for display purposes. If you are creating a thumbnail, all you have to do is check the box and when you save, one will be created for you. Next put in a short title for the photo, as well as a description (such as, in a family photo, L-R, etc). 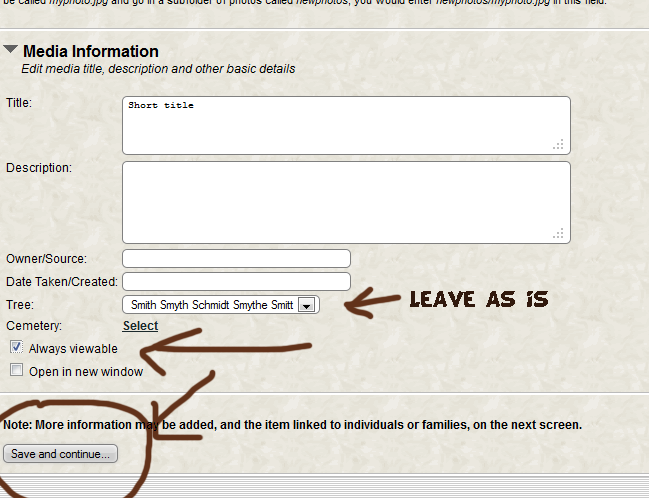 Put your name or kit # as the source, and you can put the date taken or created. If you want it always shown on the page, click ALWAYS VIEWABLE. For a headstone pic, you need to do two extra thing in the second menu. 2. Where you see the line under MEDIA LINKS that shows ACTION- TYPE, NAME, ID, Click the green ACTION icon. You will, from the popup window that comes up choose BURIAL and make sure the SHOW option is checked, then save. This will put the picture in the correct row on the person's page.